Been hiding away in my shop, I have:) Working on fun stuff! Up until very recently, if you browsed my shop, there were no rings. Not that I don’t love them. I admire them in other people’s shops and on Pinterest all the time, but and this is a big BUT for me, making them and more specifically making ones that will fit, has been a major hangup for me. Don’t ask me why, but the thought of angry customers beating down my door, demanding their money back because I am too stupid to make a ring in the size that fits them, gave me the shivers. The fears were real! Of course I am being overly dramatic and having a terrific imagination doesn’t always work in my favor. They make tools for that. And if used as intended, you will actually wind up with a ring that is the correct size. I know that – now. And since that revelation and a little nudging by the universe, I haven’t been able to stop myself. Naturally I was curious to see what they would look like in a thinner gauge and larger stack, as well as a single texture. What fun to be able to make something all your own and being able to change it from day to day! 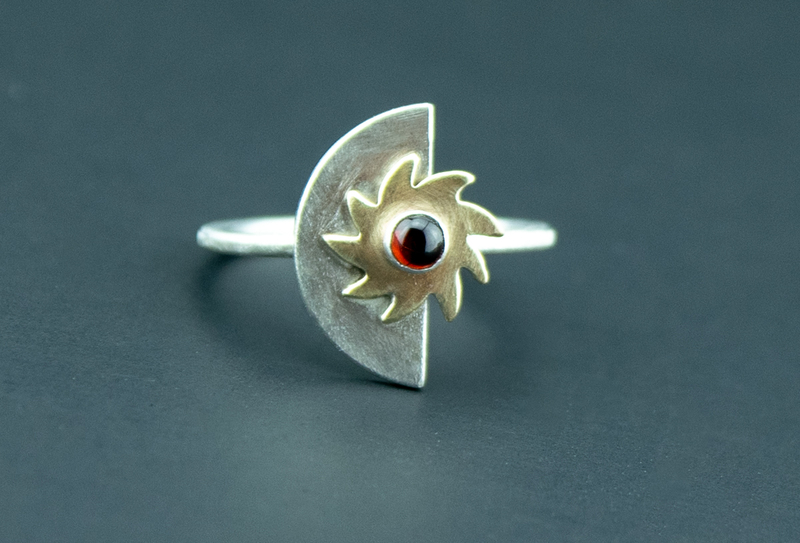 I may have unleashed a monster;) As of this writing, I am eagerly awaiting my order from Rio, which will include thicker gauge sterling silver sheet, so I can create this style ring in all silver. I already own jeweler’s brass sheet and cannot wait to make them in it as well. So, what do you think? Are you a fan of stacking rings? I can consider myself a convert, that’s for sure. Which design is your favorite? Do you have a certain kind of project or design you’ve been intimidated by? I say go for it! Personally speaking, the designs that are the most difficult in your mind are also the most rewarding when they turn out well. I love the patterns on the rings and I love stacking rings too. I’m most intimidated by working with sheet metal, until now I managed without it but I have seen some awesome designs made with it. Carina, you really don’t have anything to loose! As creative as you are, I’m sure you will come up with some wonderful designs!